Posted on July 4, 2013, in etsy, giveaway, WedEclectic and tagged bouquet, bridal, Claybouquetshop, Etsy, giveaway, jewelry, Wed Eclectic, Wedding, wedding accessories, weddings, wedeclectic. Bookmark the permalink. 105 Comments. THe Vivian Swarovski Crystal and Cubic Zirconia Rhinestone Ribbon Bridal Headband Headpiece Is beautiful I love the bouquets too but I am in love with headbands! i really love the becky headband! also the bouts are awesome! I love the Pearl and Crystal Fireball Necklace. I Follow ClayBouquetShop on Twitter. I Follow @WedEclectic on Twitter. Oh my gosh! Everything looks amazing! I love the hair pieces. I love the Melody – Pearl and Swarovski Crystal Necklace. Love the Angelina – Rhinestone Medallion Ribbon Headband! I can’t help it. I have three favourites: Antoinette, Sophia, and the calloped Rhinestone Ribbon Headband. Gorgeous! Jennifer Truong- Friended WedEclectic on Facebook! 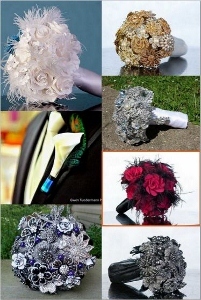 Fave item is A Brooch Boutonniere to match your Brooch Bouquet! My favorite item is the Vivian Swarovski Crystal and Cubic Zirconia Rhinestone Ribbon Bridal Headband Headpiece! My fave item is the White Poppy Clay hairpin. My fav.item are all the bridal sashes! Pingback: Creative Wedding Stuff » A giveaway announcement!